RANCHO SANTA MARGARITA, Calif. (BRAIN) — Felt Bicycles has reorganized its sales structure in an effort to “better serve a dynamic dealer base and present a new offering under the Rossignol Group of brands,” the company announced. TORONTO (BRAIN) — Cervélo is bringing assembly of bikes sold in Canada, the U.S. and the Americas to North America. Assembly to take place in same facility as Santa Cruz bicycles. HEERENVEEN, Netherlands (BRAIN) — Accell Group announced Friday that it has increased its minority stake in Velosophy to take over 100 percent ownership in the Dutch e-cargo bike company. VANCOUVER, British Columbia (BRAIN) — Velofix and Zwift have announced a partnership for Velofix’s mobile bike shops to provide installation of Zwift’s online training platform. 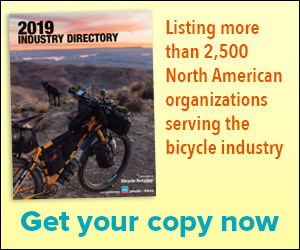 SAN JUAN CAPISTRANO, Calif. (BRAIN) — The National Association of Music Merchants (NAMM) and Interbike have teamed up on a panel discussion for Wednesday of Interbike Marketweek.